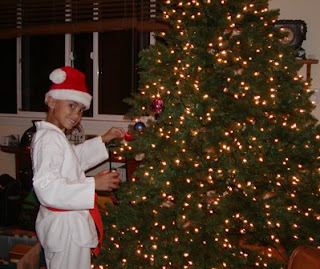 2) Decorating a Christmas trees while my kids wear the Elf hats or Santa's hats. We've had a variety of elf hats through the years. we've also had different varieties of Ginger Bread Houses. And the Santa photos are so cute! For more works for me Wednesday, visit Shannon at Rocks In My Dryer. Lots of fun and good stuff and helpful tips in there! 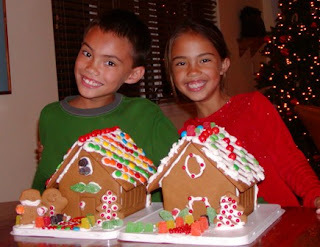 Liza - we LOVE to do gingerbread houses! Great reminder that I need to be thinking about that and gathering decorating supplies. My mother in law is FAMOUS for her gingerbread houses and often picks up the slack when I'm having a busy Christmas. In other words, she has them all ready to decorate and swoops the kids off for a party. I end up with a gorgeous gingerbread house (after enjoying some time alone). I love the elf hat idea. Thanks. Traditions are so important in life and having pics to show your kids growing up through them is a good idea, too. Thanks for sharing. We will be making those houses on Sunday :) !! Sweet matching smiles! What a great idea to take pics of the kiddos in the same place every year--easy to see how they've grown!